Courtesy photo Lil Tony is hoping to be adopted. 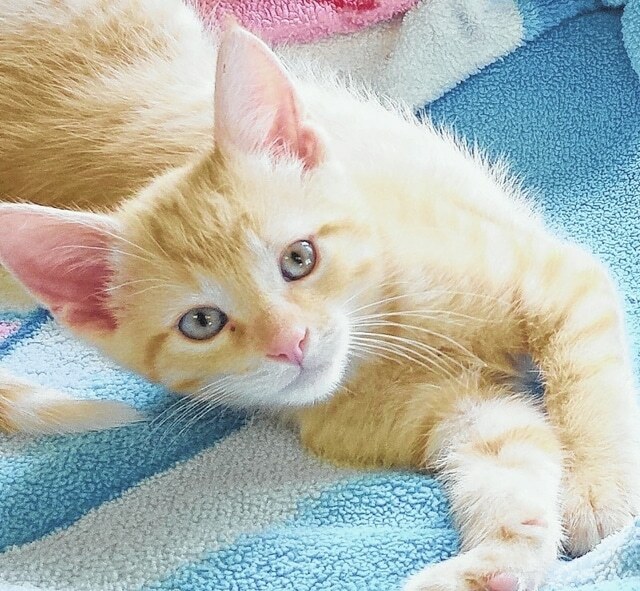 This handsome kitten is looking for his forever home. Lil Tony is a quiet and gentle fellow who likes to be held. He has the softest, pale orange fur. Lil Tony is one of the sweetest kittens you will ever meet. Lil Tony would be happy sitting on your lap or next to you on the couch. This little boy would love to become the center of your attention. Lil Tony has a delightful personality and likes to play. He is a very social kitten and gets along with the other cats at the shelter. If you are looking for a terrific companion that will provide you with years of love and affection, then look no further. He is up to date on his shots. Lil Tony has been wormed and he tested negative for feline leukemia. He is litter box trained. Lil Tony will have a neuter certificate when adopted. He would make a great addition to any family. Open your heart and home to this cute boy. Lil Tony is waiting for you. Stop by Paws Animal Shelter located at 1535 W. U.S. Route 36, Urbana, Ohio 43078, or call Paws Animal Shelter at 937-653-6233. The shelter hours are Tuesday-Friday 12-5 p.m., Saturday 12-4 p.m., Sunday and Monday-closed. There are many wonderful cats, adorable kittens and fun-loving dogs at the shelter waiting for good homes. Paws Animal Shelter has a lot of kittens and cats to feed and is in need donations of Purina Kitten Chow and Purina Complete Cat Chow. Currently we have enough Purina dog chow thanks to generous food donations. We also could use donations of bleach, laundry detergent and clumping cat litter. Paws Animal Shelter is a no-kill shelter. We are a nonprofit organization that operates only by donations. We do not receive any city, county or state funding. We depend on public donations and our adoption fees to run the shelter. Please consider making a donation to help fund our shelter. We are always looking for volunteers to come to the shelter and help out. You could play with the cats or dogs to help socialize them. There are many small jobs that a volunteer could do. We also need volunteers to foster cats, kittens, dogs or puppies. Lil Tony is hoping to be adopted. This handsome kitten is looking for his forever home. Lil Tony is a quiet and gentle fellow who likes to be held. He has the softest, pale orange fur. Lil Tony is one of the sweetest kittens you will ever meet. Lil Tony would be happy sitting on your lap or next to you on the couch. This little boy would love to become the center of your attention. Lil Tony has a delightful personality and likes to play. He is a very social kitten and gets along with the other cats at the shelter. If you are looking for a terrific companion that will provide you with years of love and affection, then look no further. He is up to date on his shots. Lil Tony has been wormed and he tested negative for feline leukemia. He is litter box trained. Lil Tony will have a neuter certificate when adopted. He would make a great addition to any family. Open your heart and home to this cute boy. Lil Tony is waiting for you. Stop by Paws Animal Shelter located at 1535 W. U.S. Route 36, Urbana, Ohio 43078, or call Paws Animal Shelter at 937-653-6233. The shelter hours are Tuesday-Friday 12-5 p.m., Saturday 12-4 p.m., Sunday and Monday-closed. There are many wonderful cats, adorable kittens and fun-loving dogs at the shelter waiting for good homes. Paws Animal Shelter has a lot of kittens and cats to feed and is in need donations of Purina Kitten Chow and Purina Complete Cat Chow. Currently we have enough Purina dog chow thanks to generous food donations. We also could use donations of bleach, laundry detergent and clumping cat litter. Paws Animal Shelter is a no-kill shelter. We are a nonprofit organization that operates only by donations. We do not receive any city, county or state funding. We depend on public donations and our adoption fees to run the shelter. Please consider making a donation to help fund our shelter. We are always looking for volunteers to come to the shelter and help out. You could play with the cats or dogs to help socialize them. There are many small jobs that a volunteer could do. We also need volunteers to foster cats, kittens, dogs or puppies.